49 HOMANN, J.- B. Totius Americae Septentrionalis et Meridionalis� ( Nuremberg, ca. 1720) Col. ancien. Infimes rousseurs, p�les mouillures marginales. - Some very light marginal water staining, paper slightly age-toned as usual. 490 x 578 mm. 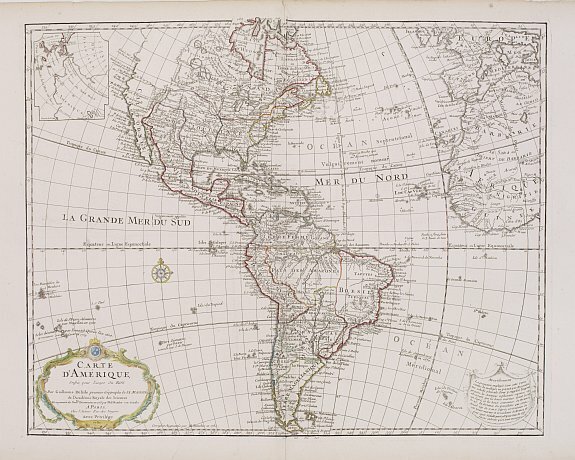 � Richly ornamented map of North and South America. Title cartouche bottom left is copied from De Fer's map of 1699 and cartouche containing text (top left) is based on De Lisle's map of Canada of 1703. 51 L'ISLE, G. de / BUACHE, Ph. Carte d'Am�rique dress�e pour l'usage du Roy. ( Paris, 1780) Limites en col. ancien. 492 x 623 mm. 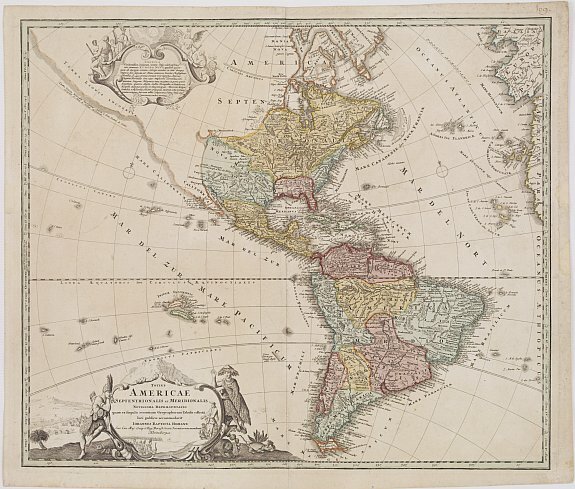 � Carte du continent am�ricain. - Prepared by G.de l'Isle and published by Phil. Buache. Redrawn and re-engraved with the inset continuation of the N.W. coast corrected according to Capt. Cook's discoveries. California is noticeably different and the names along the west coast are considerably altered, e.g. Monterey is now shown at the head of R. du Carmel. To the north appears "entr�e d'Aguilar, entr�e du Roi Georges and Fousang des Chinois". The Great Lakes are now more accurately drawn and the huge L.Bourbon compressed. Port Royale, Halifax, Plaisance (New Foundland) Portsmouth, Philadelphia shown. The Papal line of Demarcation and the Isles de Quiros are erased and the title cartouche has been enlarged.